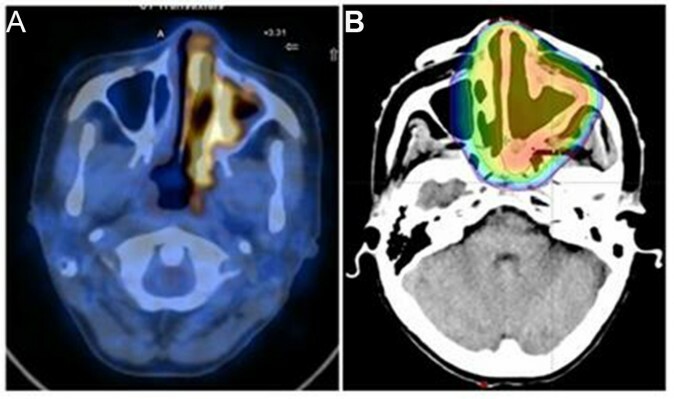 Background: This study aims to retrospectively analyze the salvage treatment outcomes and prognostic factors of patients with early stage locoregionally recurrent (LRR) extranodal natural killer (NK)/T-cell lymphoma, nasal type (ENKTCL). Methods: Between January 1995 and December 2014, 540 patients with stage IE–IIE ENKTCL received chemotherapy (ChT) and/or radiotherapy (RT) in our hospital, and among these, 56 patients who experienced LRR were included in this study. Salvage treatments included RT alone in 4 patients (7.1%), ChT alone in 30 patients (53.6%), and ChT combined with RT in 22 patients (39.3%). Median RT dose was 50 Gy (range 36–60 Gy). The effect of salvage treatment on overall survival (OS) rate from start of initial treatment (IT) as well as that after recurrence was analyzed. Results: The overall median follow-up time from IT was 35.9 months, with a 3-year OS of 72.7%. The median follow-up time after relapse was 14.8 months, and the 3-year OS after relapse was 57.8%. Compared to ChT alone (n=30), treatment with salvage RT (n=26) improved the OS from IT (p=0.040) and after relapse (p=0.009); further, re-irradiation improved the OS from IT (p=0.018) and after relapse (p=0.019). Acute and late toxicities after re-irradiation were mostly grades 1–2 (84.3%). At both univariate and multivariate analyses, better Karnofsky Performance Score (KPS), RT in IT, and RT in salvage treatment were found to be significant factors influencing OS after recurrence. Conclusion: Salvage RT improved survival in patients with LRR stage IE–IIE ENKTCL, and the treatment toxicity was acceptable.